Great show last night. Thanks to everyone who skipped American Idol and came out to see the show. Special thanks to Micky and Sandy (sushi!) and No Substitutions (sitcoms and vomit!). Really great sets. 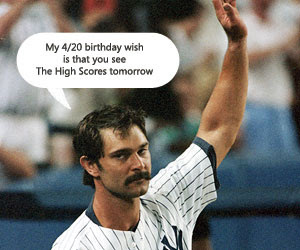 Don't disappoint Donnie Baseball and make sure to see The High Scores tomorrow. With special guests Micky and Sandy and No Substitutions! See us at 8:30 on Tuesday, April 4/21 at The City at The Broadway Comedy Club. That's some great sketch and improv for only $5 and a drink. Good times. It's the room on the 1st floor. -Take the C to 50th (8th ave) and go up to 53rd and turn left.